Is lemon water in the morning a part of your nutritional breakfast? If not, it should be! Lemons are bursting with a host of nutrients, including calcium, fiber, iron, vitamin C, and magnesium—meaning if you include a glass of lemon water with your breakfast, you’ll get a much-needed (and delicious) boost of energy to start your day. Lemon juice can be very hard on the enamel on your teeth, which is the outer coating that protects the health of your teeth, preventing sensitivity and decay. Unfortunately, because tooth enamel isn’t made of living cells, once it’s gone, it’s gone. For this reason, you will want to dilute the lemon with water. Try mixing the lemon with warm water. If you consume a cup or two of warm water in the morning, it will help rehydrate the body and regulate the digestive system. Lemon juice and lemon water promote healthy digestion by relaxing the toxins in the digestive tract—this will assist in relieving symptoms of heartburn, bloating, and indigestion. The liver is active when you sleep, since the body regenerates during rest. Make sure to drink plenty of water throughout the day (and start the day with a refreshing glass of lemon water) to help your body perform to the best of its abilities. Drinking lemon water in the morning can also help stimulate the production of bile and stomach acid. Lemons contain potassium and vitamin C, which are known to help improve immune system function. Drink a tall glass of lemon water each morning so your body can effectively absorb the vitamins and give your system a much-needed immunity boost! Drinking lemon water will help flush out the toxins from your body and assist with beautiful, glowing skin. Lemons are rich in antioxidants, which can help decrease blemishes and wrinkles by combatting the oxidative stress and free radical damage that can prematurely age skin. You can also apply lemon (diluted with a bit of water) topically to scars to help reduce their appearance and keep the skin taught and smooth. German researchers found that drinking enough water each day can help increase the metabolism, thereby helping you manage and maintain a healthy weight. 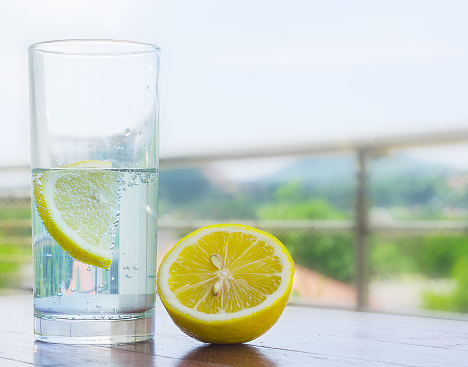 Adding lemon to metabolism-boosting water is an easy way to add flavor without the calories. Similarly, drinking warm lemon water in the morning in place of store-bought fruit juices or sugar-laden specialty coffees can substantially lower your caloric intact, leading to further weight loss. If you get the morning jitters from drinking coffee, try replacing it with lemon water. This antioxidant-rich beverage will leave you feeling refreshed and full of energy, but without the caffeine jitters and without the midday crash that often comes with drinking coffee. Did you know that drinking lemon water can help relieve toothaches and gingivitis? Just make sure to wait at least half an hour after drinking to brush your teeth, as citric acid can wear away at your enamel. Are you constantly fighting a viral infection? Warm lemon water can help decrease the symptoms of a viral infection, including a sore throat. Cut the lemon into two pieces and squeeze the juice of one half of it into the water. Peel the ginger root, slice it, and add it to the water. Let it sit for a minute or two, then drink and enjoy! Berries: Summertime means berry season and there are lots of seasonal options at your local grocery store. Consider adding strawberry slices, cranberries, or blueberries to your lemon water for an extra boost of vitamin C, antioxidants, and fiber. Mint: Add a couple sprigs of mint to your lemon water for a refreshing twist. If you have seasonal allergies, mint can provide a little bit of sinus relief in the mornings as well. For a stronger flavor, muddle the mint sprigs in the bottom of your glass with the lemon juice before adding water. Cucumber: Simple and refreshing, simply add four or five cucumber slices to your cup of lemon water. Watermelon: Since watermelon is mostly water, this ingredient adds further hydration to your lemon water along with a subtle sweetness. For more flavor, crush some watermelon in the bottom of your glass before adding lemon and water. Other Seasonal Fruits: Get creative and see what appeals to your taste buds by picking up a new seasonal fruit at the store each week and adding it to your lemon water in the morning. Two recommendations that pass my taste test: peach and grapefruit slices. Peaches will assist with digestive health and grapefruit offers all the benefits of lemon with a flavor twist. BONUS TIP: To boost the flavor of your lemon water and provide a cool, refreshing drink later in the day, make a pitcher of lemon water with your favorite ingredients and let it “brew” in the fridge for the day. “The Benefits of Lemon Water,” Wellness Mama web site; http://wellnessmama.com/35192/benefits-of-lemon-water/, last accessed June 30, 2015. Brady, K., “11 Benefits of Lemon Water You Didn’t Know About,” Lifehack web site, http://www.lifehack.org/articles/lifestyle/11-benefits-lemon-water-you-didnt-know-about.html, last accessed June 30, 2015.